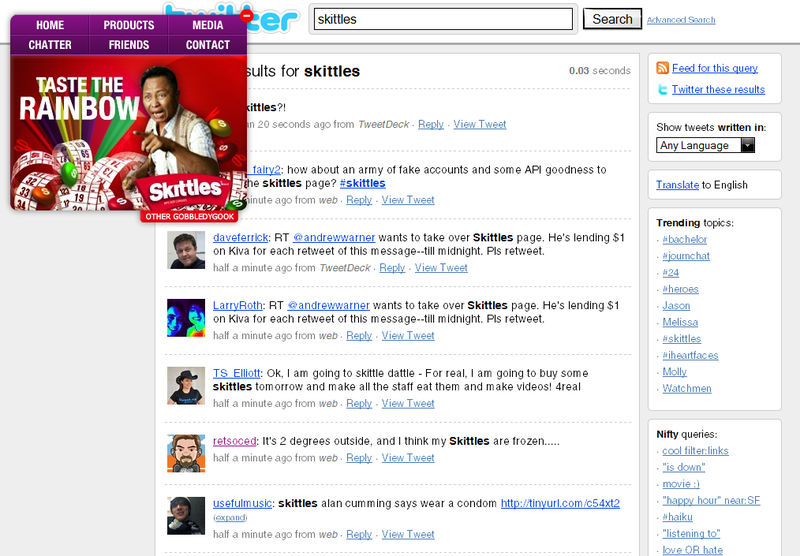 The interwebs is indeed all aflutter about the new Skittles website, or lack thereof. If you haven’t seen it or heard about it, go there and go there now. I’ll wait…. Good. It’s actually really freakin’ cool what Agency.com did for Mars and Skittles – albeit it’s nothing more than a stunt and doesn’t really accomplish what we would traditionally look at a website to accomplish. But that’s the gorram point, and I like it for a couple of reasons. First, they didn’t leave any of the big-kids out, they incorporated twitter, facebook, flickr, and youtube intoÂ the distributive content site that would be Skittles.com. This creates a holistic social experience unparalleled in the corporate would, and helps the rest of us drag our clients and employers ever closer to embracing the undiscovered country. Second, it’s a brilliant co-branded endeavor. How so? Agency.com is getting just as much press as the Mars Corp. on this one since they are the evil geniuses behind this affront to Social Media Experts (or pundits) everywhere. Lastly, this really takes some ginormous brass balls. Just look at tweets behind their interface for more than two minutes. The webtards are out in full force reveling beautifully in their full tard regalia of vulgar ignorance. Go intarwebs! Others are appalled or shouting rip-off from the rooftops, but nothing is really 100% new; everything is derivative. So climb down off of your weeble-wobble and join the rest of the reality toting weboids and just enjoy the site for what it is – an innovative approach to corporate communications in social networking. It’s so seldom that we get introduced to something that smacks just about everyone in the face; good or bad. As a web designer, I don’t know if I would recommend a company to do this with their website. Notice this isn’t with the parent company though – it’s just Skittles.com. Looking at it now, I can see the value in doing something like this, but really what is its longevity? I wouldn’t want my kids to go out to this site and be subjected to the unintelligible strings of crap that spew forth when you get there. Even if I just turned 5 yesterday, I still get to see the webtards in action behind the No way, Jose sign. As a stunt to get a big boost in recognition and chatter over a short period of time… BINGO! This hits the jackpot. Money well spent. Love it or hate it – in the end this site is accomplishing exactly what it was built to do. – Look Ma! I’m on Skittles!